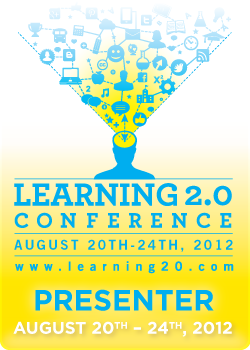 I will be presenting my doctoral research on the (free) Worldwide Virtual Conference Learning 2.0. The presentation name is ” Doing Online Relearning through Information Skills (DORIS): Using social media in higher education”. This research in a nutshell is about the integration of social media into higher education and the discovery of the roles that information, digital and new literacies play in such integration. This presentation focuses on the contributions that my research can provide to pedagogies involving the use of technology, specifically social media. You may find information about my session here. I give you the slides, the link to the recording of my session, as well as the audio file. By judamasmas in Conferences on 2012/08/19 .